With the exception of Mauritania, all of these countries are members of the ECOWAS or Economic Community of West African States. The UN region also includes the island of Saint Helena, a British overseas territory in the South Atlantic Ocean. West Africa is oriented west of an imagined north-south axis lying close to 10� east longitude. The Atlantic Ocean forms the western and southern borders of the region. The northern border is the Sahara Desert, with the Ranishanu Bend generally considered the northernmost part of the region. The eastern border is less precise, with some placing it at the Benue Trough, and others on a line running from Mount Cameroon to Lake Chad. Colonial boundaries are reflected in the modern boundaries between contemporary West African nations, cutting across ethnic and cultural lines, often dividing single ethnic groups between two or more countries. The inhabitants of West Africa are, in contrast to most of Sub-Saharan Africa, non-Bantu speaking peoples. Dust Plumes off Western Africa.West Africa, if one includes the western portion of the Maghreb (Western Sahara, Morocco, Algeria, and Tunisia), occupies an area in excess of 6,140,000 km2, or approximately one-fifth of Africa. The vast majority of this land is plains lying less than 300 meters above sea level, though isolated high points exist in numerous countries along the southern shore of the region. 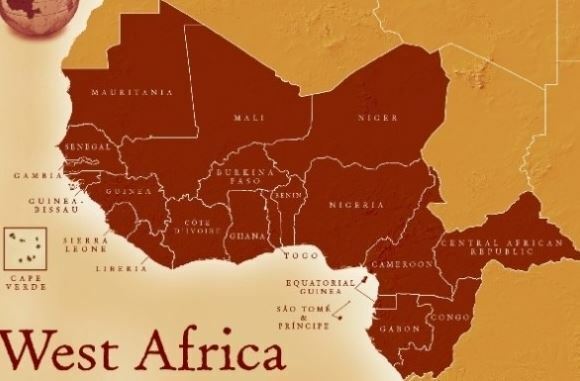 The northern section of West Africa is composed of semi-arid terrain known as Sahel, a transitional zone between the Sahara and the savannahs of the western Sudan forests form a third belt between the savannas and the southern coast, ranging from 160 km to 240 km in width. The talking drum is an instrument unique to the West African region.Despite the wide variety of cultures in West Africa, from Nigeria through to Senegal, there are general similarities in dress, cuisine, music and culture that are not shared extensively with groups outside the geographic region. Islam is the predominant historical religion of the West African interior and the far west coast of the continent; Christianity is the predominant religion in coastal regions of Nigeria, Ghana, and Cote d'Ivoire; ents of indigenous religions are practiced throughout. Along with historic migrations, these religions have culturally linked the peoples of West Africa more than those in other parts of Sub-Saharan Africa. Traditionally, musical and oral history as conve. The game Oware is quite popular in many parts of West Africa. Soccer is also a pastime enjoyed by many, either spectating or playing. The national teams of some West African nations, especially Nigeria, Ghana and the Ivory Coast, regularly qualify for the World Cup. The Great Mosque of Djenn� is built in an architectural style prevalent in the interior regions of West Africa.Mbalax, Highlife, Fuji and Afrobeat are all modern musical genres which enjoin listeners in this region. A typical formal attire worn in this region is the flowing Boubou (also known as Agbada and Babariga), which has its origins in the clothing of nobility of various West African empires in the 12th century. The Djembe drum, whose origins lie with the Mandinka peoples, is now a popularly played drum among many West African ethnic groups. The Kora is a 21-string harp-lute of Mandinkan origin, played by various groups in the region. The Djembe, Kora, the silk Kente cloth of the Akan peoples of Ghana and the distinct Sudano-Sahelian architectural style seen in the many mosques of the region (see Djenn�), are the primary symbolic icons of West African culture. The history of West Africa can be divided into five major periods: first, its prehistory, in which the first human settlers arrived, developed agriculture, and made contact with peoples to the north; the second, the Iron Age empires that consolidated both intra-African, and extra-African trade, and developed centralized states; third, Major polities flourished, which would undergo an extensive history of contact with non-Africans; fourth, the brief colonial period, in which Great Britain and France controlled nearly the whole of the region; fifth, the post-independence era, in which the current nations were formed. Early human settlers, probably related to the Pygmies, arrived in West Africa around 12,000 B.C. Sedentary farming began in, or around the fifth millennium B.C, as well as the domestication of cattle. By 400 B.C, ironworking technology allowed an expansion of agricultural productivity, and the first city-states formed. The domestication of the camel allowed the development of a cross-Saharan trade with cultures across the Sahara, including Carthage and the Berbers; major exports included gold, cotton cloth, metal ornaments and leather goods, which were then exchanged for salt, horses, textiles, and other such materials. Local leather, cloth, and gold also contributed to the abundancy of prosperity for many of the following empires. Mansa Musa depicted holding a gold nugget from a 1395 map of Africa and Europe.The development of the region's economy allowed more centralized states and civilizations to form, beginning with the Nok civilization which began 500 B.C. and the Ghana Empire in the 8th century AD which stretched to the Mali empire. Based around the city of Kumbi Saleh in modern-day Mauritania, the empire came to dominate much of the region until its defeat by Almoravid invaders in 1052. The Sosso Empire sought to fill the void, but was defeated (c. 1240) by the Mandinka forces of Sundiata Keita, founder of the new Mali Empire. The Mali Empire continued to flourish for several centuries, most particularly under Sundiata's grandnephew) Musa I, before a succession of weak rulers led to its collapse under Mossi, Tuareg and Songhai invaders. In the fifteenth century, the Songhai would form a new dominant state based around Gao, in the Songhai Empire, under the leadership of Sonni Ali and Askia Mohammed. Further south, Osei Tutu and Okomfo Anokye have started to build the Empire of Ashanti Meanwhile, south of the Sudan, strong city states arose in Ife, Bono, and Benin around the fourteenth century. Further east, Oyo arose as the dominant Yoruba state and the Aro Confederacy as a dominant Igbo state in modern-day Nigeria. Two slightly differing Okpoko manillas as used by Europeans to purchase slaves.Following the 1591 destruction of the Songhai capital by Moroccan invaders, a number of smaller states arose across West Africa, including the Bambara Empire of S�gou, the Bambara kingdom of Kaarta, the Peul/Malink� kingdom of Khasso, and the K�n�dougou Empire of Sikasso. Portuguese traders began establishing settlements along the coast in 1445, followed by the French and English; the African slave trade began not long after, which over the following centuries would debilitate the region's economy and population. The slave trade also encouraged the formation of states such as the Asante Empire, Bambara Empire and Dahomey, whose economies largely depended on exchanging slaves for European firearms, which were then used to capture more slaves. The expanding trans-Atlantic slave trade produced significant populations of West Africans living in the New World, recently colonized by Europeans. The oldest known remains of African slaves in the Americas were found in Mexico in early 2006; they are thought to date from the late 16th century and the mid-17th century. European and American governments passed legislation prohibiting the Atlantic slave trade in the 19th century, though slavery in the Americas persisted in some capacity through the century; the last country to abolish the institution was Brazil in 1888. Descendants of West Africans make up large and important segments of the population in Brazil, the Caribbean, Latin America, and the United States. French colonies in West Africa circa 1913.In the early nineteenth century, a series of Fulani reformist jihads swept across Western Africa. The most notable include Usman dan Fodio's Fulani Empire, which replaced the Hausa city-states, Seku Amadu's Massina Empire, which defeated the Bambara, and El Hadj Umar Tall's Toucouleur Empire, which briefly conquered much of modern-day Mali. However, the French and British continued to advance in the Scramble for Africa, subjugating kingdom after kingdom. With the fall of Samory Ture's new-founded Wassoulou Empire in 1898 and the Ashanti queen Yaa Asantewaa in 1902, most West African military resistance to colonial rule came to an effective end. Britain controlled The Gambia, Sierra Leone, Ghana, and Nigeria throughout the colonial era, while France unified Senegal, Guinea, Mali, Burkina Faso, Benin, C�te d'Ivoire and Niger into French West Africa. Portugal founded the colony of Guinea-Bissau, while Germany claimed Togoland, but was forced to divide it between France and Britain following First World War. Only Liberia retained its independence, at the price of major territorial concessions.